No liner needed with this fabric shower curtain. Designed and produced by well-known German brand Kleine Wolke, established in 1968, and is backed by their quality guarantee. Quick-dry and easy-care polyester fabric, water resistant, durable and long wearing. Multi-Color : Three beautiful parrots perched and playful. Design includes a bright pink and red parrot, light blue and a bright green parrot. 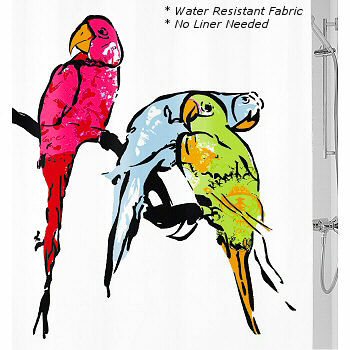 The parrot design takes up most of the shower curtain.